Thank heaven for little girls! And for adorable arrangements like this one! 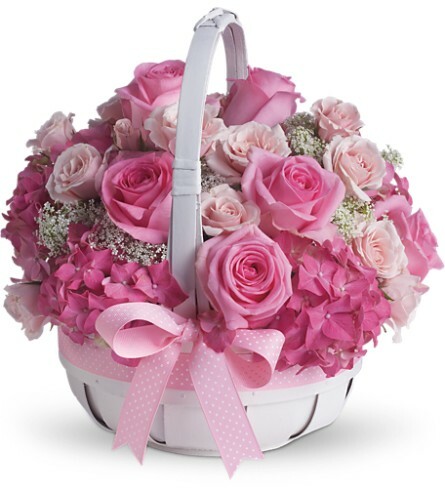 Perfect for new moms, new babies and girly-girls of all ages, this sweet basket of pink petals is sure to get a warm welcome! 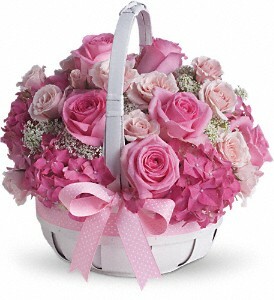 Pretty pink hydrangea, roses and spray roses along with Queen Anne's lace are delivered in a charming white basket that's all wrapped up with a pink bow. Say hello to beauty, cutie!